As frightening truths are unveiled and a one-of-a-kind offer is made, Lena will have to decide whether love is worth the loss of her freedom, or if freedom is worth the ultimate cost…her life." Vampires are forever my favorite paranormal creature. I never got over them and I never will. So I’ve always loved this series from Amalie and this little surprise had me super excited. It was really interesting going back in time to see what exactly went down with Lena and Christian and Lucian all those years ago. Look I’ll be honest. I never loved Lena and Lucian, but somehow this story worked for me. And I never thought it would happen, but I felt bad for Lucian and Lena. I even kinda understand why Lucian grew to have such contempt for his brother. I can’t blame him to be quite honest. And as a self-proclaimed Christian fangirl, I really don’t like admitting that, but it is what it is. Also, watching him court someone who is not Tori made me irrationally angry, but that’s just my allegiance to Tori showing. Anyway, I thought I knew their tangled backstory but getting this little novella really added to what I thought I knew and rounded out the world nicely. Lena is fierce and she has to be admired for that. And quite frankly, Lena and Lucian are perfect for one another. They are both wild and fierce and free. 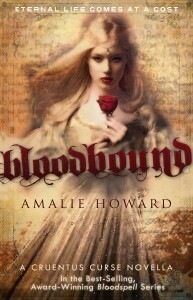 Bloodbound was a fun trip back to the Cruentus Curse series. I didn’t know I needed this story until I got it but need it I did. I really love this series and if you are a vampire fan you’ve gotta pick it up. I really need to give Amalie's other book a read. I feel so bad I never got around to it. I haven't read a vampire book in awhile lol.